Way back in the Spring when I finished Hanami, I had it in my head to write a tutorial on how to do the beaded bind off. Spring led to Summer and a ton of travel, Summer led to Fall and we moved across country so the tutorial fell into the drawer of One Day. As it turns out, One Day is today. This version of the beaded bind off is really easy with the right tools. The first thing is to get a small enough crochet hook to fit through the bead and still have room for the yarn. The one shown here is ridiculously small (0.75mm;) it's way teenier than it needs to be, but it was what they had at the store AND it was on sale. That makes it the right size for me. I'm not a beader, so I don't really how the sizes work, but the ones I used are 6/0 seed beads. The yarn is the leftover Seasilk from Hanami, but with the right combo of yarn and beads, you can use this cast-off on anything. The bind off is essentially the same as normal with the addition of adding the bead on every other stitch. 1. Start by knitting one. 2. Put a bead on the crochet hook and take that first stitch off the right hand needle. 3. Hook the stitch with the crochet hook and slide the bead down over it. 4. Put the stitch back on the right hand needle. 5. Knit the next stitch. 6. Pass the beaded stitch over just like a normal bind off. 7. Knit the next stitch and pass the first one over. 8. Repeat steps 2-8 until you're finished. 9. Marvel at the sparkliness of your finished handknit. Easy hey? As always, bigger pictures in the flickr set. I've been making wristlets for ages now and I thought I'd share my recipe since they're appearing with less frequency in the Splityarn shop (that'll happen after you make 80 gazillion of something.) I wasn't really thinking about it when I started, but choosing (notoriously hard to photograph) red as a key component to the project made for some challenging photo edits. My apologies that the pics aren't quite up to snuff. I'm only posting the basic pictures here, but there's more detailed photos and notes in the accompanying flickr tutorial set. From the outer fabric cut 2 pieces 8" x 6.5" and one piece 10.5" x 1.25"
From the inner fabric cut 2 pieces 8" x 6.5"
1. Starting with the lining, pin the zipper to one of the lining pieces both with right sides up. Stitch across the top from end to end, fairly close to the zipper (if you have a zipper foot, now is a good time to use it.) 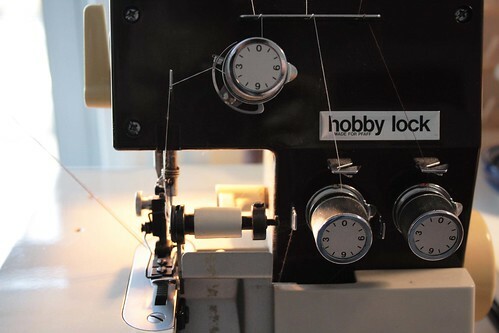 when you're approaching the slider and pull tab, stop with the needle down, lift the presser foot and open the zipper past the foot up into where you've already sewn. This is key to getting a nice, straight line. Repeat with the 2nd piece of lining and the other half of the zipper. I don't usually bother with pressing until after the next step. 2. To sew the outer pieces to the zipper and lining, place the right side of the zipper on top of the right side of an outer piece and pin. With a pencil or chalk mark in about .5" from the edge (right about where the metal pieces at the end of the zipper are). This time you're not going to sew all the way across. You're going to sew over top of the previous stitching but between the two points you just marked. Repeat with the remaining outer piece. 3. 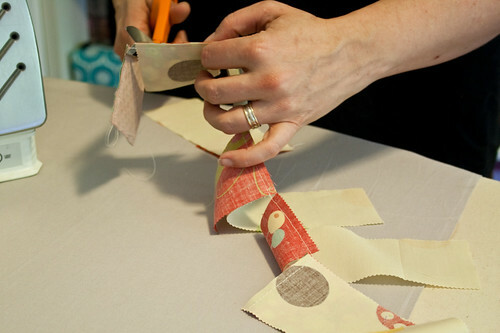 Press the fabric away from the zipper, just like how it will be when it's finished. Press! Press! Press! This is critical to a nice looking piece. This is the difference between homemade and handmade. 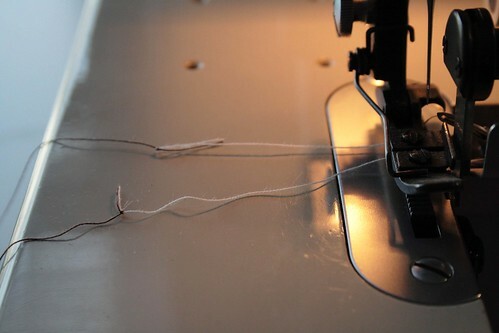 You won't get a chance to redo it after you stitch it down, so take please take time to do it right. 4. Now you're going to top stitch the zipper down. When I do this I like to top stitch only the outer piece down onto the zipper, keeping the lining out of the way. I also like to double my thread when I top stitch in a contrasting colour; it makes the stitching pop a little more and look deliberate. 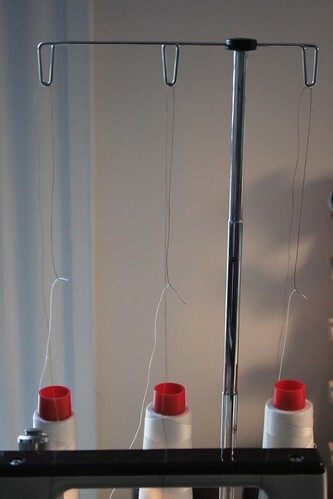 Just thread your machine like you normally would, but use two pieces of thread for your needle. Leave the zipper foot on and stitch between the metal ends of the zipper. Do this on both pieces. 6. Open up the zipper at least 2/3rds of the way and flip both pieces of the lining out of the way to sew later. Fold the wrist strap in half pin it to itself, then pin it onto one side of one of the outer pieces, about .5" down, raw edges together, parallel to the zipper. Pin the outer pieces right sides together and sew from the top edge of the outer piece around 3 sides to the other top edge (1/3 - 1/2" seam allowance.) Be careful not to catch the lining in the seam. The half inch you left unsewn when installing the zipper allows you to fold the lining out of the way. 7. Pin the right sides of the lining pieces together. Mark off an opening of at least 2 inches. I like to do this along one of the sides so when I close the seam at the end it's less noticeable. Sew the lining together all the way around the three sides, leaving the opening (of course) This time you'll catch a little of the tops of the outer pieces as you start and finish. 8. 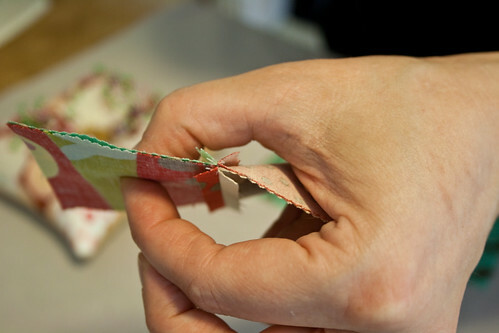 Clip your corners and turn right side out through the opening you left in the lining. Wiggle the corners out and then all that's left is to close up the hole in the lining. 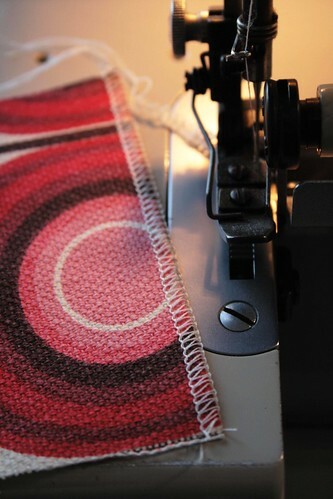 You can do this by hand, but I detest hand-sewing anything so I do it by machine. It leaves a wee ridge, but because it's on the inside, you won't really notice it. If you have any questions, please feel free to ping me. If you make one, be sure to send along a photo for the gallery! I’m regularly asked about my photos of my knitting and sewing, so I thought I’d put together a run-down of how I get good quality pictures to best show off my projects without a photo studio. It's by no means a professional set up (as you'll see,) but the result of much trial and error. I put so much time and effort into knitting, why not give it that last touch of love and make a stellar photo? Mother Nature was cooperating and gave me a non-rainy day, so here's my go at a "How I Take Good Pictures of my Knitting." I don't worry about needing a fancy-shmancy digital SLR (my camera is an old Nikon Coolpix and works just fine.) I’ve managed some great shots even with a super cheapo camera; all I need is a stable surface. I’m wobbly at the best of times, so the best money I ever spent was for a teeny tripod . I found mine at Target for around $15 (they have a cheaper one now too.) It's small enough that the camera still fits in my purse even with the tripod attached. That's handy, because it's holding my broken battery door closed. I found the best spot to set up is in our backroom. The windows are huge, but the sun doesn't shine directly in, resulting in soft, filtered light. I never use the flash, so it's important to have ample light, but not direct sunlight. I find the shadows from the sunlight are too harsh and I can't get accurate depictions of colour. I lean a big piece of white poster board ($0.42, also at Target,) against a chair and tape it secure for a background. The beauty of using painters tape is that it's removable and doesn't damage the poster board. If I'm careful, one piece of poster board will last for a year as long as I can store it flat to avoid wrinkling. Using the white background means nobody knows how messy the house is or that fabric scraps are ALL OVER the floor. If I can avoid the cleaning, I will. I also keep a lint roller handy. We live in a house with two cats and no matter how careful I am, there's cat hair everywhere. With the white background set up, I bring in the knitting. I fuss around for a while arranging it, making sure I get all the objects in the shot but preserving the white as background. There's usually some shuffling of positions until I get something that looks right. Now for the fun part: I take a bazillion pictures from a bazillion different angles, all with the flash off and the macro setting on. It's worth learning how to find these features on your camera. I can't change the depth of field with my point-and-shoot, but I have a macro setting (Nikon's is a flower symbol) and I can turn off the flash (museum settings and custom settings.) When you use a flash with knitting, it can wash out the colours and make everything look like acrylic, which is not ideal. It will pick up every fibre and stray hair and make the yarn look icky, so turn off the flash! Sometimes I'll stuff some tape in to give dimension or to hold down and hide an errant unwoven end. When I think I have enough photos, I take a couple more for good measure. It’s always better to have too many to choose from than not enough. I leave the photo shoot set up while downloading the pictures to see how the photos turned out. If I missed an important feature, or I cut off the ends of the needles, I can tromp back in to re-shoot without having to set it up again. The final step is to tweak the results in Photoshop Elements. I crop, adjust the colours and mess with the levels. Depending on what time of day I shoot, the white background can have a blue-ish cast, so I took a little time to learn about the white setting on my camera as well Photoshop fixes. That's a tutorial for another time, but I suggest giving the auto-levels and auto-colour correction features a try. It’s amazing the difference they can make. Besides, if I don't like what comes out, I’m just a ctrl-z away from the original. The best pictures come when I take time to set up and compose the shot, take more pictures than I think I’ll need and gently nudge things around digitally. I have some photos in my Flickr finished objects set that hopefully speak for themselves. It's really basic; all you need is two pieces of fabric and a closure of your preference. Snap, button, Velcro, magic - whatever you have in the stash. I'm using a snap so I'll add it on last. You may have to make adjustments to add on your closure at a different point in the process. 1. 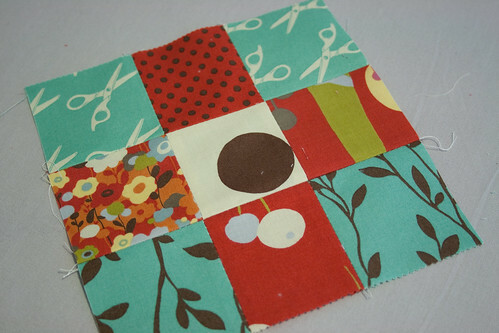 Cut your each piece of fabric each into a 3.75" x 10.5" rectangle. You could make a template or draw it on a piece of paper to make a pattern piece. 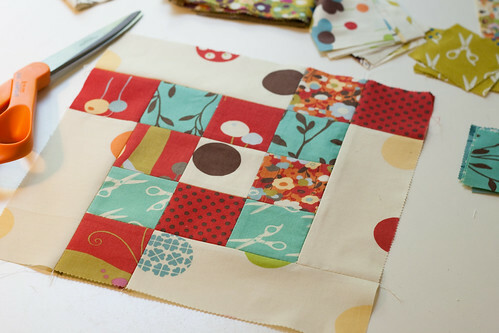 I'm a quilter, so I use a rotary cutter for precision, but it's not necessary. As long as the pieces match up, you'll be fine. 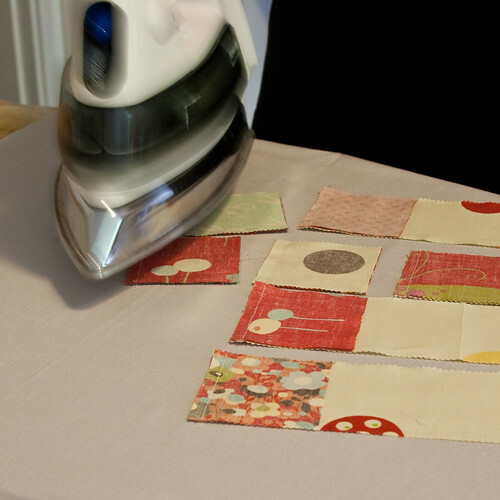 If you're worried about making it perfect, cut your fabric out with right sides together. That way they'll line up when you sew them together. 2. Pin the pieces right sides together and sew all the way around with a 3/8ths seam allowance. Leave a 3 inch opening on one side (or wide enough to turn it right side out.) Backstitch on either side of the opening. It needs to be a little stronger here for when you turn it right side out. Later on when you stitch up the sides you'll stitch right over this hole to close it up. 3. Clip the corners and turn the piece right side out through the opening. Wiggle the corners out by rolling them between your fingers or use a bone folder to push them into place. I don't have a bone folder, I fake it with an envelope opener. Does the trick nicely. 4. Press. Press. Press. I can't emphasize enough the importance of pressing. Too often I see a perfectly good bag or purse made to look shoddy and homemade because the maker doesn't take the time to iron the seams properly. Press! 5. Fold the purse to create the pocket. Line up the sides and pin it leaving 2 inches at the top for the closing flap. 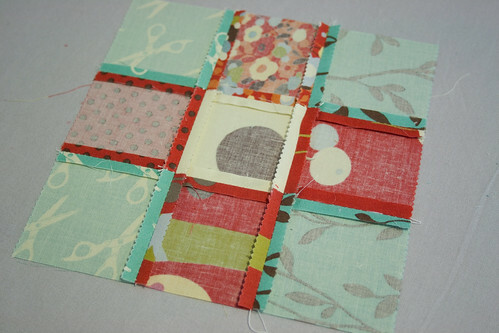 With a 1/8 seam allowance, starting at the bottom, stitch up the side, around the top and back down the other side. Backstitch over the tops of the pocket for reinforcement at the pressure points. 6. Fold the flap down to close the purse (I press here too!) and mark where you want to add your snaps. Pound those suckers on and you're done. 7. Sit back, smile and admire your handiwork. And when folks ask, tell them splityarn told ya how to make it! If you don't have a sewing machine you can always check the etsy shop for ones that I've made. I'm hoping to keep these as a standard in the inventory. They're pretty cute! If you make the case a little longer, it would work as an ipod mini case too. A few months ago, Amanda of Soulemama came across a great organizational idea for storing your fabric stash. The idea is that you wrap all your fat quarters and hunks of fabric around these plastic boards so that they're all the same size thereby making everything easy to stack and see. While my stash is not enormous by any means, I still couldn't justify the cost the plastic boards. The idea of the boards had been rolling around in my brain for a few months, when I had an epiphany in of all places, a comic book shop. The Husband and I have a deal - for every moment (or dollar) spent at the comic shop, he'll spend an equal amount of time in a yarn shop. Accordingly, this means that I never put up a fight when it comes time for him to catch up on the latest Justice League issues. So while I was standing in the shop, somewhat awkwardly with my arms at my sides, not wanting to touch anything comic-y, it hit me. Comic book boards! True comic book geeks store all their issues in a plastic bag with a board in it to keep the issues pristine. The perfect size and stiffness for organizing the stash. 100 boards for less than $7. Can't beat that. I spent yesterday going through my fabric bin and reorganizing. I folded pieces to the right height, wrapped them around a board and held them closed with a pin. Anything that wasn't big enough to wrap around a board goes into the scrap pieces bin. I'm not quite finished, but now my fat quarters and random yardage are all colour coded and can be seen perfectly. I love it when one geeky habit feeds another. A few weeks ago I caught a teaser for an old episode of Gilmore Girls. Rory or Lane (I can't be sure - it flashed by pretty quick) was wearing a black t-shirt with a skull and crossbones on it. I'm not sure that I saw it right, but I'm fairly certain the skull was made of buttons. I tried to track down a picture online but came up empty. I immediately drew a wee sketch on the white board because I knew I was going to make one. This morning I finished it. Super easy! Get yourself a plain t-shirt and a handful of mismatched buttons from your stash (see? I knew I'd find a use for 'em). I used an Old Navy tee I picked up this weekend, but you could do this on pants or a bag or anything really. You'll also need some chalk, an image with a good outline (google image search), a handful of pins and some fabric glue. Center the image on the shirt and outline the edges with the chalk. That way you can try on the shirt to make sure the image isn't sitting too low on the front porch (if you know what I mean). If it is, you've only used chalk and it brushes away really easily. Put a folded towel inside the shirt and start pinning the buttons inside the lines. Once you have them all cute and in a good place, bring on the fabric glue. This is where I had a minor problem. You can't just pull the shirt off the towel with all the pins in it to head over to the sewing machine and you don't want to lose the button placement, so dab a teeny, tiny, little drop of glue underneath each button. Just enough to tack it down, not so much that it gooshes up through the buttonholes. Once the glue is mostly dry (I'm very impatient, but I managed to let it dry overnight. Good Girl), you can sew the buttons on by hand (time consuming) or be lazy like me and do it by machine. I'm fairly certain there's a proper setting on my machine to do this, but I just drop the feed dogs and set the zig zag stitch to the same width as the button holes. The chalk comes off in the wash and voila! I was thinking this would be cute as flowers or birds too, I'm just on a skull kick this week. Ever have one of those t-shirts that you love, but just don't seem to wear to often? Maybe the hem has fallen down a little, maybe the neckline is too tight, that sort of thing. This band's show t-shirt had been sitting in my 'to be mended' drawer for a couple months. This weekend it was time to do something about it. When my mum upgraded her sewing machine many years back she gave me her old one (she's since upgraded a few times, but I haven't been the lucky recipient again). When she handed it over, she said something to the effect of "I did SO much lettuce edging for your t-shirts on this machine when you were little, that it's fitting that the machine should be yours. This machine WANTS to be with you to thank you for all the work it got." Fine by me! So when I set out to fix up my shirt this weekend, it also seemed fitting that I should add some lettuce edging. I've had the machine for 15 years and hadn't edged anything with it at all. I couldn't find too many lettuce edging tutorials out there, so here's mine in 6 super easy steps. 3. 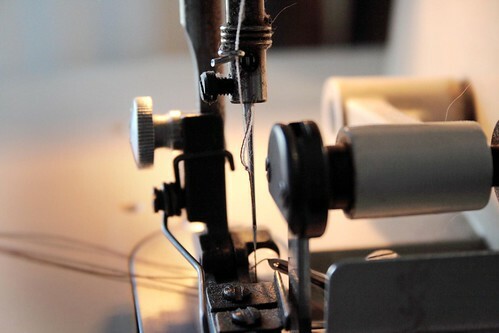 Set your sewing machine to a zig zag stitch. 4. Sew along the raw edge of the shirt, stretching the fabric as you go. 5. Take it out of the machine, stretch it a little more with your fingers, and TA DA! Lettuce Edges! 6. Wear it out and feel that 1970's girlie vibe!